The 2010 SEMA Show will mark the debut of the all-new Toyota Prius PLUS Performance Package, a new hybrid performance line by Toyota Racing Development (TRD). Developed to meet the evolving demands of the growing hybrid segment, PLUS enhances the driving experience for Toyota hybrid enthusiasts by offering cool and fun accessories that add sporty looks with performance handling. The new PLUS package also features several Toyota accessories that complement the Prius’ core values of Eco and Advanced Technology. 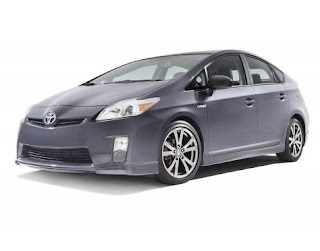 The end result is a more fun-to-drive, performance-enhanced Prius that maintains its industry-leading fuel efficiency. The Prius PLUS Performance Package starts with a seven-piece aerodynamic body kit including a uniquely styled rear diffuser, which enhances its already sleek appearance and maintains its 0.25 coefficient of drag. The aero kit also includes front and rear bumper spoilers and side skirts, which are complemented by race-inspired 17-inch forged wheels. Their higher strength-to weight ratio assists in keeping the corner weight down and performance up, while maintaining the Prius’ overall light vehicle weight and high fuel efficiency. The wheels are fitted with low profile 215/45R17 tires and have a custom offset, which increases track width yet maintaining Prius’ rolling resistance. The PLUS package delivers surprising traction and handling without sacrificing any fuel efficiency. Improved performance handling is achieved with the installation of sport-tuned lowering springs that provide a lower center of gravity, enhancing the vehicles on-road performance through quicker turn-in, enhanced steering response and improved cornering ability. A rear sway bar is added to reduce body roll for flatter, more stable cornering and maneuverability. The package also includes exclusive floormats with a “PLUS” logo and a unique “PLUS” exterior badge. The new Prius PLUS Performance Package represents the first installment of the new PLUS brand of accessories from Toyota and will be available in limited production beginning in April 2011.